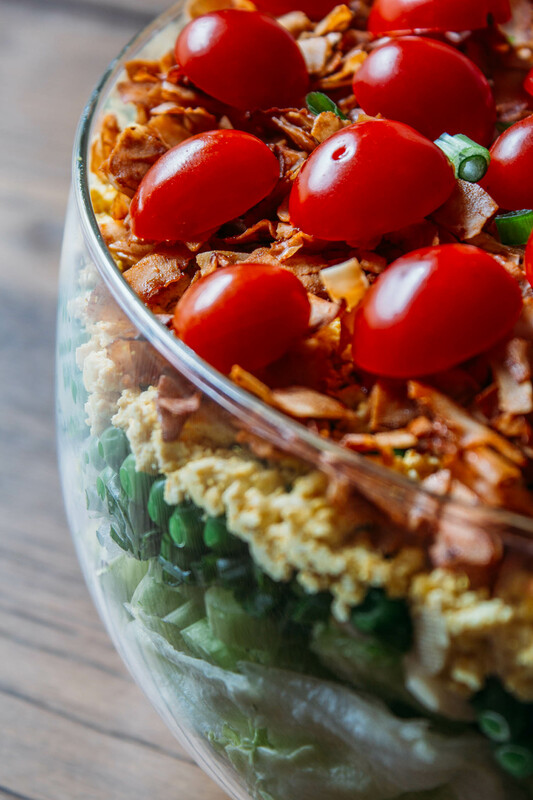 Our eye-catching Vegan 7-Layer Salad is a terrific showpiece dish to share with anyone who usually moans when they see a salad approach. But I’m convinced that the willingness to eat certain foods has everything to do with the presentation. After all, what’s not to love when the waiter dramatically grinds the fresh pepper way above the bowl? Isn’t it pure pleasure watching the black flakes tumble through the air before gently landing onto your food? The entire experience often feels like a front-row seat to an Oscar-winning performance! And as much as I’d like to do away with rash judgments based on looks, let’s face the facts; we do eat with our eyes first. In this modernized salad, I’m the first to admit that presentation counts for at least a fraction of its attraction. But no worries, just because it looks good doesn’t mean that it’s difficult to make! However, looks aren’t everything. And in this case, right after everyone oohs and ahs over how beautiful your Vegan 7-Layer Salad looks, they’ll rave about how incredibly impressive it tastes! By the way, I think my new take on Vegan 7-Layer Salad tastes a bit like eggs and bacon! And I think some of the taste magic comes directly from my recipe for Vegan Fakin’ Bacon and Vegan Hard-Boiled Egg Crumble. 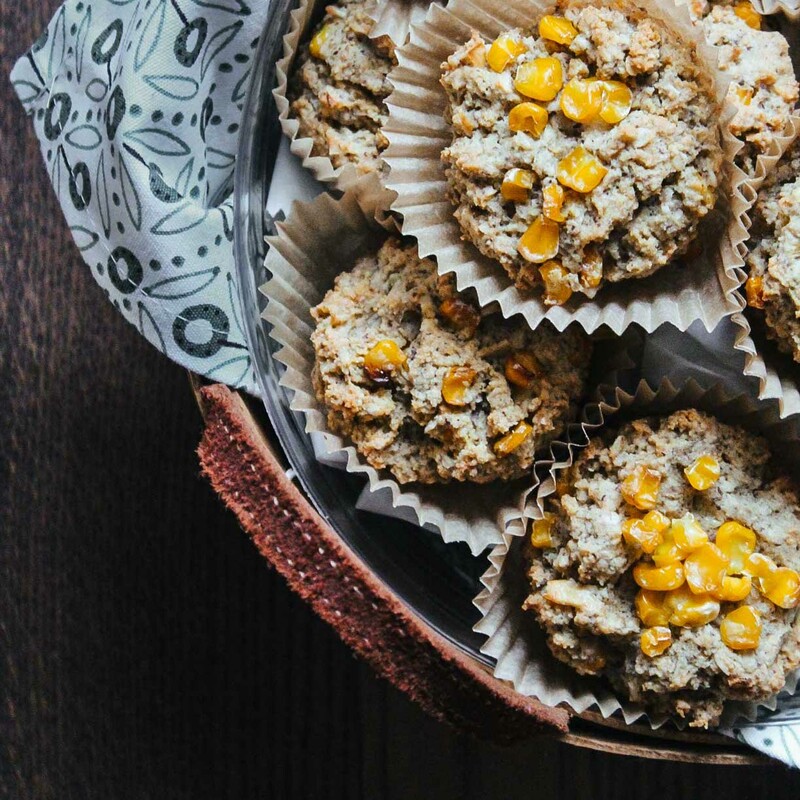 Additionally, each of these plant-based and gluten-free flavor bombs is remarkably easy to make. And if you would like to make this southern classic, refined oil-free, I suggest you try using a batch of our homemade cashew mayonnaise in the recipe rather than store-bought. Want to know why I chose to recreate this recipe? Well, I noticed a prepackaged layer salad at Publix and it sparked a memory. My Mom loved the traditional version of this salad and use to ask me to make it for special occasions. So when the good memories ignited, I eagerly Googled to see if anyone had attempted a vegan version. My search led me to the Minimalist Baker’s fantastic rendition. In her post, she attributed Pioneer Woman as inspiration. The recipe I share here is my plant-based interpretation of the classic recipe I use to make before going vegan. 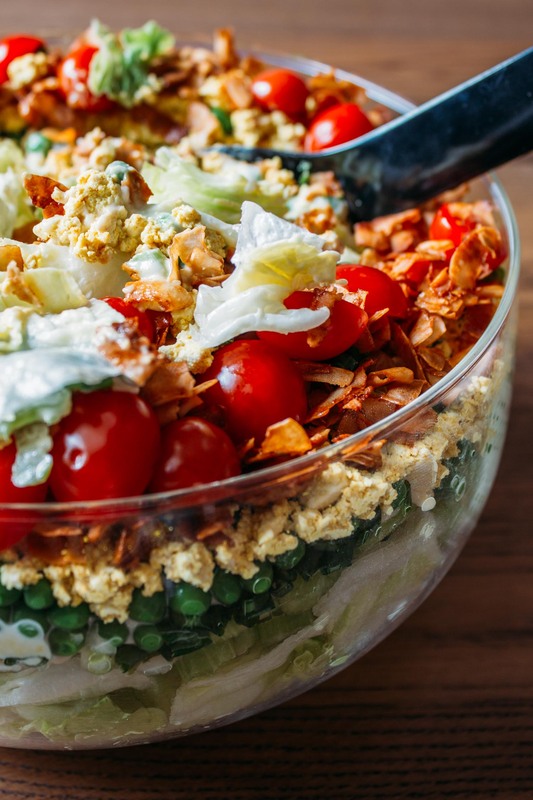 The sheer wow-ness of my Vegan 7-Layer Salad may cause you to think of new reasons to invite friends over as an excuse to whip out your favorite gorgeous salad bow and stack up this impressive, rich and creamy palate pleaser! The magnificently decadent flavors that unite in our Vegan 7-Layer Salad are nothing short of marvelous! Bring this savory jackpot of bacony, creamy, crispy fresh taste to your next potluck and flutter your eyelashes in gratitude as a stream of genuine admiration and amazement comes your way. 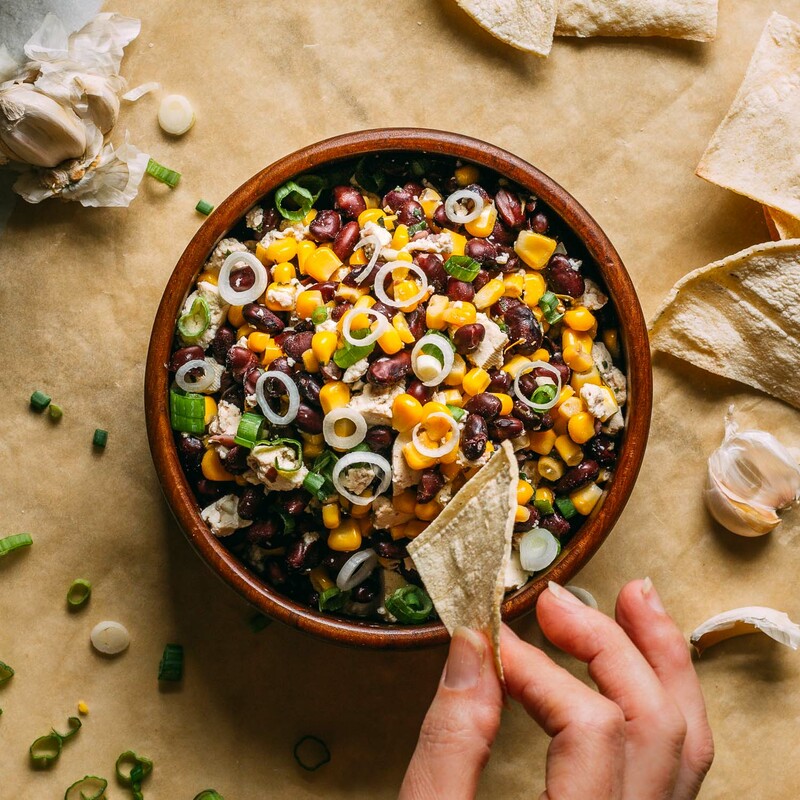 (Nobody will believe that this is plant-based, vegan, and gluten-free! By the way, get ready for the invites, too, because sharing this salad is sure to get you invited to all of the best potlucks for years to come! 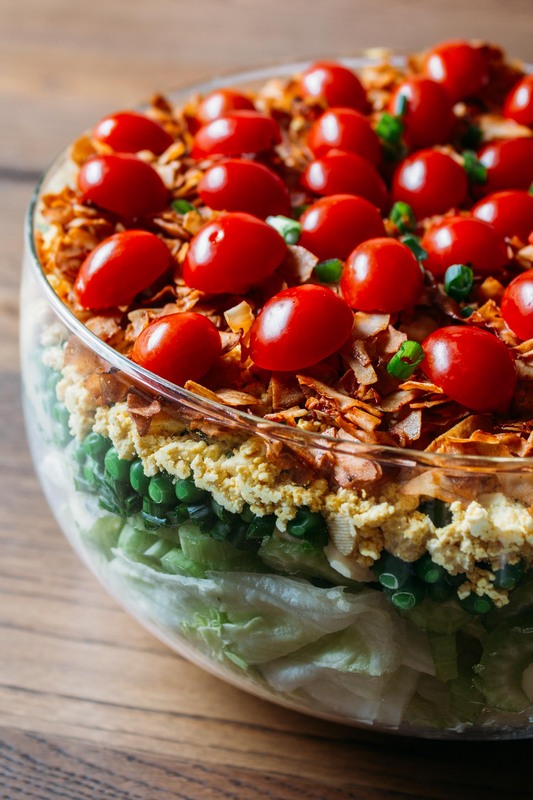 Providing, of course, that you promise to bring this infamous Vegan 7-Layer Salad! And to make this salad, refined oil-free, be sure to use our homemade vegan mayo in place of store-bought. one small head of green iceberg lettuce, rinsed, dried, and chopped - Use any preferred salad green in place of the traditional iceberg. 1 cup of plant-based mayonnaise - In place of store-bought mayonnaise, here's a nutritional improvement. Make this recipe using our deliciously simple oil-free mayo recipe! dash of sea salt, to taste - My favorite is this pink one! To begin, add the chopped lettuce to a large clear glass serving bowl. 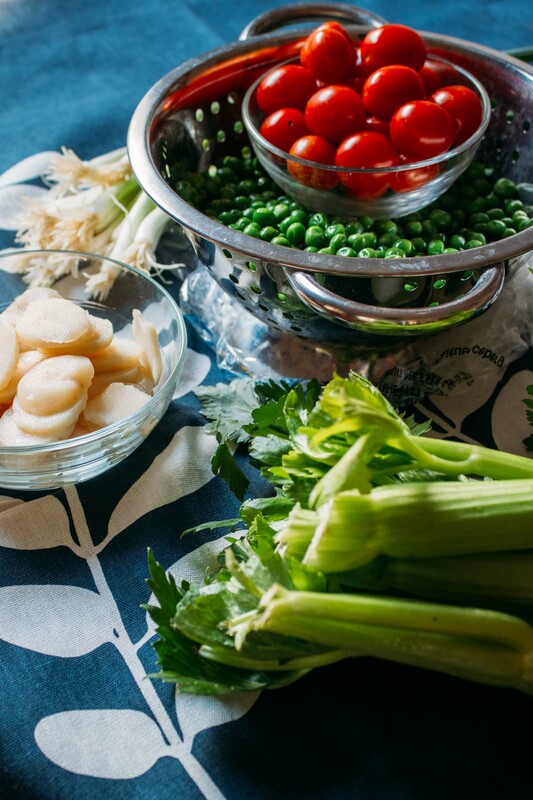 Follow that with a layer of celery, green onions, water chestnuts and thawed green peas. The order of the ingredients following the lettuce doesn't affect the flavor. Be creative, have some fun stacking the layers as you wish! Next, in a medium mixing bowl, combine the vegan mayo, nutritional yeast, maple syrup or agave. Whisk to combine. Taste and adjust flavor as needed, adding more nutritional yeast for savory umami, lemon juice for acidity, maple syrup for sweetness and possibly a dash of salt. Remember, to make this salad, refined oil-free, use our easy to make cashew mayo in place of store-bought. It's always a good idea to taste and season each component of a dish while you're making it. But keep in mind that everything in a recipe ultimately needs to work together. So as you're sampling the dressing in this recipe to adjust the seasonings, keep in mind that the flavorful Vegan Fakin' Bacon and Vegan Hard-Boiled Egg Crumble will soon be joining the flavor party. After it's seasoned how you like, top the salad with the rich and creamy homemade dressing. Using a spoon or spatula, smooth the whipped mixture in an even layer, completely covering the top of the salad. And last but not least, It's time to add the "bacon and eggs." First, top your lovely salad with 1-cup of my Vegan Hard-Boiled Egg Crumble. Next, arrange the sliced tomatoes to your liking. And finally, for the crowning glory of your gorgeous Vegan 7-Layer Salad, sprinkle on 1-cup of Vegan Fakin' Bacon flakes. Before digging in, be sure to take a moment to enjoy this lovely looking salad... it's a showpiece! 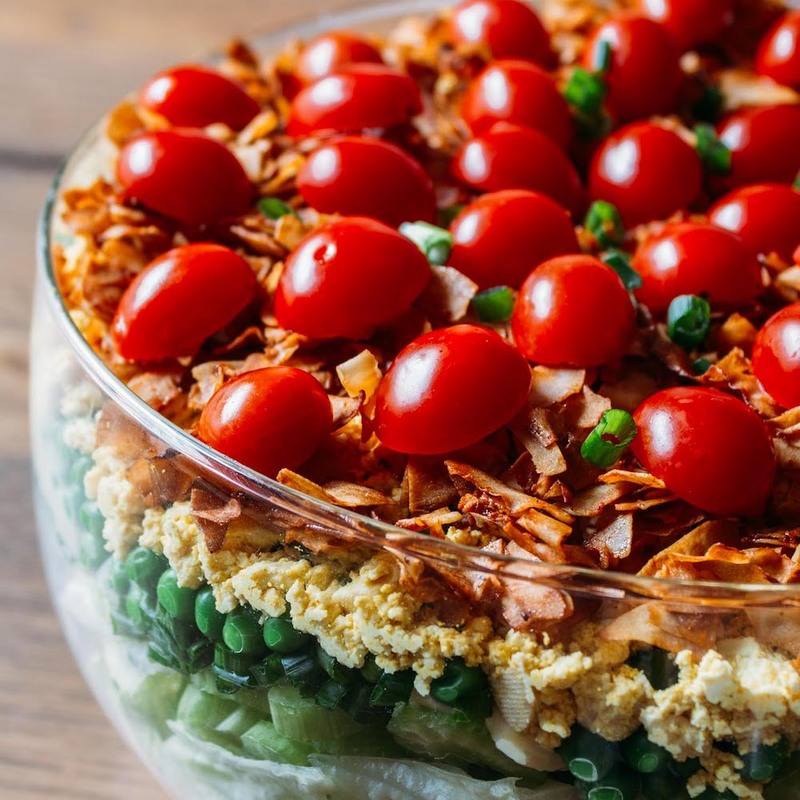 You can enjoy your Vegan 7-Layer Salad immediately, or you may cover and refrigerate to serve later. Store any leftovers in the fridge a day or two, though this dressed salad tastes best when fresh. The calorie and nutritional information for this recipe are approximate since personal taste decides the final amount of seasoning ingredients such as maple syrup, agave, salt, etc. 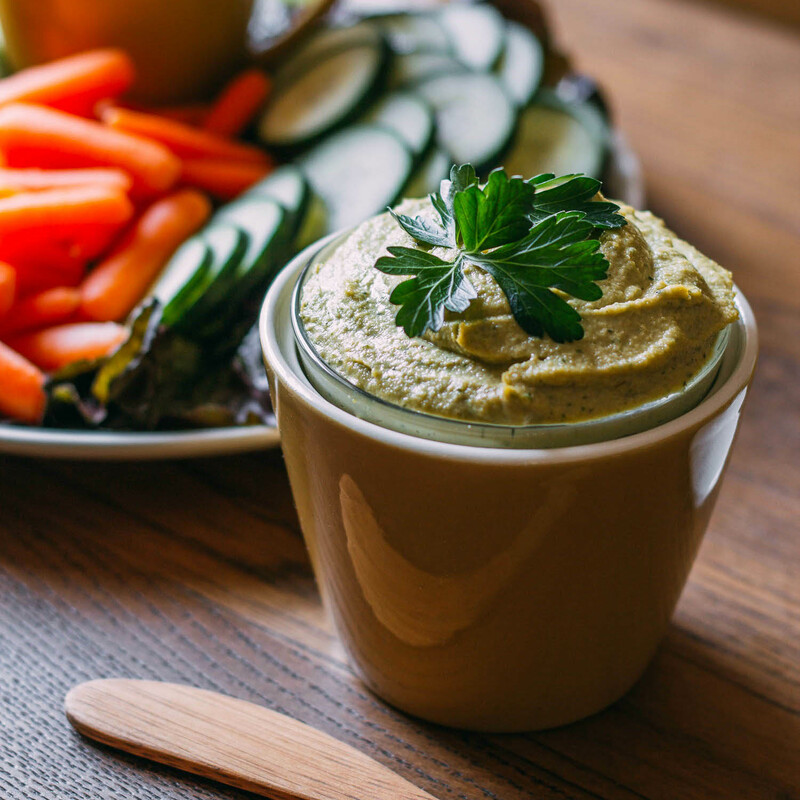 Note that the nutritional info will improve when you opt to use homemade, refined oil-free, cashew mayonnaise in the place of the store-bought variety. And dare I say, you may find that your salad tastes better than ever, too! We love our mayonnaise recipe! To reduce the calories and fat when using store-bought mayo rather than our delicious oil-free homemade option, try using plain coconut yogurt for about half of the store-bought vegan mayo. It will still contain oil from the store-bought mayo, but at least the amount of oil will be reduced. Looks great but that mayo is a little pricey. Can you make one similar to it? Hi, Beth. While I haven’t landed on my favorite way to make my own traditional mayonnaise yet, I am working on an oil-free plant-based version that I will share as soon as it’s delicious! The brand of mayo I mention liking in my ingredients list is available at most grocery stores where it’s competitively priced. The price for this brand through Amazon is quite a bit higher than if you were to buy it at your local grocery store. I hope that helps. Thank you for this recipe! I brought this salad to our Thanksgiving dinner and it was a big hit, with vegetarians and meat eaters alike. I did make a few small changes though. I was making the salad at 9am for a 5 pm meal, so I didn’t bother thawing the peas. They thawed out in the salad and were perfect at serving time. I saved the bacon bits side and put them on right before serving, because I was afraid they might get soggy in the all day. (That fake bacon is the bomb, btw) I also couldn’t find my black salt, so I scrambled the tofu like I would for a breakfast burrito; adding Dijon mustard, garlic and onion powder, and tumeric. After tasting it later in the day, I think that little touch of the Dijon and spices blended really nicely with the dressing. So thanks again! I’ll be making this regularly for big gatherings. It was beautiful on the table and everyone gobbled it up. Thank you for sharing that this salad is a hit, Meg. And thanks also, for sharing what you did with the tofu to make it egg-like in a pinch without the black salt. Oh, and putting the peas on frozen works nicely when this salad has to travel over the river and through the woods without refrigeration.